My son affectionately likes to refer to me as 'Joan' (as in the old Hollywood actress with the alleged aversion to wire hangers and clutter) because of my incessant need to clean and purge drawers and cabinets at odd hours. My mother was like that and I suppose I inherited her want to pitch unnecessary things into the trash. In my defense, my kid is a pack rat and our house is small so 'stuff' gets to be too much sometimes. I mean really, does a household of two honestly need 32 travel mugs/cups? No, it does not. Hence, my ritual purging. 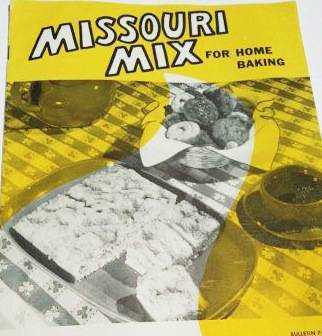 It was during one of my recent decluttering sprees that I came across my mother's early 1960s "Missouri Mix" recipe booklet from the University of Missouri Extension, then known as the Agriculture Experiment Station. Before I was born, Mom and Gran were members of the "Progressive Homemakers Club" in the Broseley area during the 50s and early 60s. They and neighboring ladies would gather regularly at each others' homes to share ideas, recipes and to socialize. In the days before social media and during a time when 'going to town' only happened every great while, these meetings were a terrific way for rural ladies to connect and help one another. A few of these rural organizations are still active locally, such as the Agee Club and the Cane Creek Club. The DAR publishes their meeting minutes regularly and I find it quite nostalgic to read these and that some organizations are still going so strong. Back to Missouri Mix. This concoction is a homemade version of the readily available commercial quick mix we've all used for biscuits and the like since its inception. However, back in the day, rural homemakers had limited access to pre-fab grocery staples as there were no superstores or internet sites from which to order. So stocking up on essentials was a necessity. Mom wasn't a very enthusiastic cook so I only remember pancakes and cheeseburger pie being made from the mix in my time. The University Extension has updated the Missouri Mix recipe by altering some of the ingredients to create a more healthy version and also scaling the bulk recipe down to fit modern needs and wants. Follow this link https://extension2.missouri.edu/gh1055 to download the new version of Missouri Mix recipe from the University of Missouri Extension - Columbia. I've also included Mom's infamous cheeseburger pie recipe at the bottom of this page for fun. Being called a 'Joan' isn't that bad if it means rediscovering treasured recipes from the past. Enjoy! 1. Preheat oven to 400 degrees F. Spray a 9-inch pie dish (an 8-inch square pan will also work) with cooking spray and set aside. 2. In a large skillet, brown hamburger meat, onion and green pepper over medium heat until meat is no longer pink. Drain. 3. Stir in seasoned salt, Worcestershire sauce, ketchup, and cheese. 4. Transfer meat mixture to the prepared pie dish. 5. In a separate bowl, whisk together baking mix, milk, and eggs, just until combined. Don't over mix. 6. Pour batter on top of beef. 7. Bake for 25-30 minutes, or until a toothpick inserted in the center comes out clean. Those homemaker club meetings always involved a great meal with scrumptious desserts—one of my favorites, Hydrox Cookie Cake/Oreo Cookie Cake! Those ladies even had a craft project each meeting. They were way ahead of their times in many ways. Omg THE HAMBURGER PIE!!! It’s been years!!! I must make it soon!